Before we begin, it should be pointed out that this article was originally written by Michael Wright and published in two parts in Vintage Guitar Magazine (April and May) in 2002. The content has been modified as discussed below. This page will be posted until such time that our own Teisco web page is compiled and in a presentable format. The original article superseded an article in Guitar Player presenting the history of Teisco, based on information painstakingly translated from a Japanese article penned by Mr. Hiroyuki Noguchi of Japan's Rittor Music, editor of the Guitar Graphic book series. Unfortunately, the article initially used for reference was an older piece which has subsequently been totally revised and corrected by Mr. Noguchi based on later interviews with principals in the Teisco Company. Some of the chronology in the Guitar Player story is inaccurate. In 2004 Michael Wright wrote an article on Jack Westheimer that was published in Vintage Guitar. This provided more information on the history of Teisco and the original article now needed to be updated with the newly sourced information. There is a very small amount of new information added to the original published article. This was provided by guitar researcher Jimmy Noise. Pictures have also been added to complement the article. The guitars pictured may not be correct for the year referenced in the article, but are the best that could be found at this time. Also some of the pictures feature guitars that are not in their original condition. So in 2012, we currently have the latest and most accurate information on Teisco (in regards to company history), confirmed in repeated direct communications with Mr. Noguchi in Japan and discussions with Jack Westheimer. But this story is not complete. Your corrections and additions are most welcome! We are contactable at MIJ_60s_Guitars@iinet.net.au or visit Help Re-Discover Teisco. Few non-American guitar brands have meant so much to so many American guitar buffs as Teisco guitars. Indeed, through their mid-'60s connection with the Sears and Roebuck company, many a modern guitar player learned his or her first chops on a Silvertone made in Japan by the Teisco company. Nevertheless, for years Teiscos were the object of ridicule, the penultimate examples of "cheap Japanese guitars" (a reputation more based on cultural chauvinism than objective analysis, truth to tell). Even Dan Forte, who essentially began the category of writing about off-brand guitars (and who has given me many an entertaining moment in my life), chose Teisco Del Rey as his nom de plume, with more than a little tongue-in-cheek humour in the selection, no doubt. Times change, of course, and so do perceptions. No longer regarded with complete disdain, Teisco guitars - which not that many years ago retailed for $59 - are now fetching upwards of $300 for average models. The highest sale recorded to date was the sale of the coveted Teisco Del Rey Spectrum 5 which sold for over $6000. With the renewed interest in these humble guitars growing, I thought it might be time to turn our intention to the story of Teisco guitars. If you like older Japanese guitars, you must obtain a copy of Mr. Noguchi's book, '60s Bizarre Guitars (Guitar Magazine Mooks, Rittor Music). It is lusciously printed in colour and, while the text is in Japanese, model names and dates are in English, so it is an invaluable reference tool, as well as a fun coffee table book. Some of the following information on specific guitars comes from this source, as well as catalogues and other research materials kindly provided by dedicated guitar fans in both the U.S. and Japan. It's virtually impossible to reconstruct a comprehensive chronology, but we will attempt to document some broad-brush details and periods of what guitars we can, and with luck you'll be able to search out and identify your favourite Teiscos with much greater authority. First of all, let's clear up some minor confusion over the name. It has been variously reported, including by me, that the name "Teisco" stands for the name of a company in Tokyo; however this is not the case. Teisco was simply the name chosen by one of the company's founders, Mr. Atswo Kaneko. There was another prominent company called the Tokyo Sound Co., Ltd. which was responsible for making Guyatone guitars, another major early Japanese brand, some of which came to the United States as Kent guitars imported by New York's Bugeleisen & Jacobson and others. However, neither of these companies or their guitars had anything to do with the Teisco brand. Teisco was the name used mainly in Japan but also on a few occasions here in the United States. I'm not sure the World Teisco brand ever got to the U.S.; my guess is that it was an export designation that went to other markets. In late '59 or early '60, Westheimer Sales Company owned by guitar importing pioneer Jack Westheimer, began to import Teisco electric guitars made by Teisco. These earliest Teiscos were the plain Teisco-brand (not Teisco del Rey). Westheimer would use his Kingston Brand and the Del Rey brand in the early 60’s. Kent guitars imported by New York's Bugeleisen and Jacobson were purchased from Teisco between to 1962 to 1963. They also imported other guitars by different manufactures at this time. In 1965 most Teisco guitars were imported into the United States by Chicago's Weiss Musical Instruments (W.M.I. Corporation) bearing the Teisco Del Rey brand name. By the mid-'60s W.M.I. was providing Teiscos to Sears and Roebuck carrying the Silvertone moniker. Around 1969 WMI acquired the rights to Kay & Harmony brands. They started to use the Kay brand on some of there imported Teisco’s. 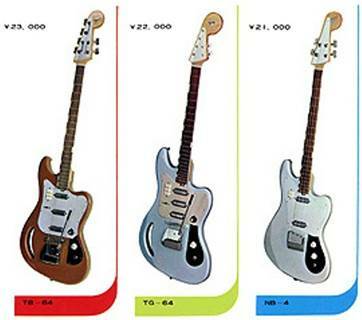 At the beginning of the Teisco saga, Teisco instruments were primarily built for domestic consumption in Japan. The early guitars were fairly high quality by contemporary Japanese standards. 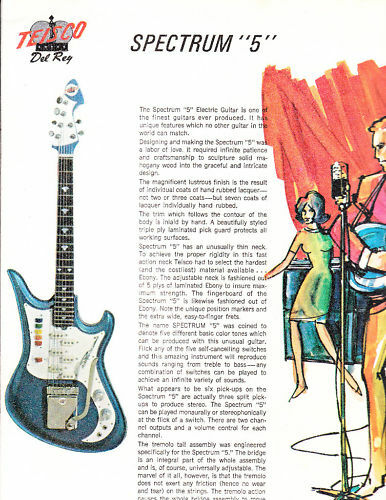 As the '60s dawned, Teisco increasingly got caught up in the export market, and by the mid-'60s were major players in the low-end or beginner arena, with instruments sold primarily by mass merchandisers such as Sears and at discount department stores which were rapidly developing at the time. It was mainly in this latter niche that Teisco guitars are known in the U.S. In order to give this narrative some structure, I've divided the Teisco history into four basic periods: I-Gibsonia; II-Frumpy Fender-ama; III-A New Spectrum of Originality; and IV-Copydelia. According to Mr. Noguchi, Teisco instruments debuted in 1946 and were made by a company founded principally by the late Mr. Atswo Kaneko, a renowned Hawaiian and Spanish guitarist, and Mr. Doryu Matsuda, an electrical engineer. Mr. Doryu Matsuda was born in 1921 and was still alive at the time of this writing. As mentioned, Mr. Kaneko gave the guitars the Teisco brand name, however, the original name of the company was Aoi Onpa Kenkyujo (roughly translated: Hollyhock Soundwave or Electricity Laboratories). This was a small workshop formed in war-ravaged Tokyo. Early Teisco instruments were primarily electric Hawaiian guitars and accompanying amps, although the company quickly got into electric Spanish guitars, too. Little information is available on these earliest Japanese Teiscos. Teisco guitars from most of the '50s were clearly inspired by Gibson; presumably this was true from the very beginning. 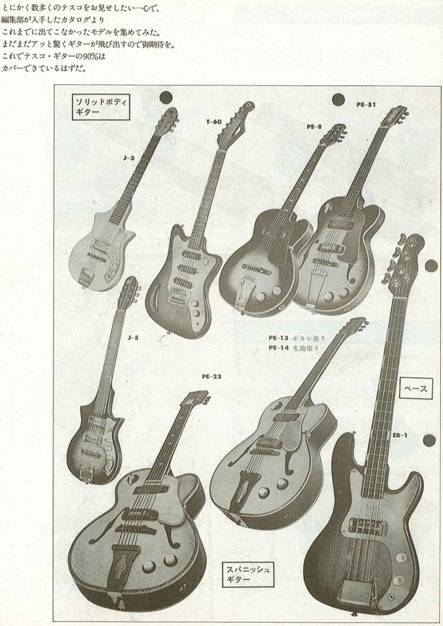 We'd welcome any information on these early Teisco guitars and amps, including photos and photocopies of catalogues or ads, from our Japanese readers, if they can provide them. Generally speaking, Teisco guitars through the mid-'60s follow a fairly logical designation scheme (although don't be surprised at exceptions). For solid bodies there is usually a one- or two-letter prefix indicating the body style or general model. This is followed by a dash and a number which usually indicates the number of pickups (e.g., J-1), although on occasion the number indicates the year of introduction (e.g., TG-54). Guitars bearing a vibrato usually appended an "L" after the pickup number (e.g., MJ-2L). Hollow bodies use either an EP or PE prefix, followed by a dash and number which indicates the specific model (e.g., EP-14). Obviously, in this case, the number is not the number of pickups! Usually higher numbers indicate more pickups, cutaways, full body depths, fancier appointments, etc. Hawaiians use the EG prefix followed by a dash and a letter which indicates the specific model (e.g., EG-R). 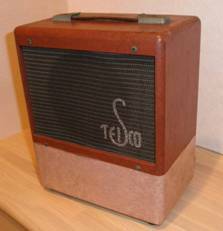 This early generation of Teiscos had long rectangular logos with italicized block letters spelling "Teisco" in English. The earliest Teisco Spanish guitar of which I'm aware was the EO-180 from around 1952. This was basically a glued-neck folk-style acoustic guitar with a three-and-three slothead, round soundhole, bound top and glued-on bridge. Essentially dissecting the soundhole was a large triangular round-cornered pickguard with a white insert shaped like a sock, toe pointing toward the head, with a white-covered pickup situated on the ankle of the sock, just behind the soundhole on the bridge side. The cord appeared to come out of the side on the lower bout. In 1953 Teisco introduced its EP-6, about which very little is known, except that the EP designation was applied to electric Spanish archtops, probably with a single neck pickup. The slightly later EP-7 was a non-cutaway, so probably so was the EP-6. By 1954 the Teisco line had begun to grow. Some valuable reference is available in a Japanese history of Teisco guitars, which is written completely in Japanese (which I unfortunately can't read). This has an early photo of the company's founders and presumably engineers and designers, mugging around a car parked in front of the Teisco factory. The photo is from the '50s (1954 or later), and the instruments in their hands and surrounding them are at the core of the '50s line. Shown were two small Les Pauls, two single-cutaway archtop electrics, at least three Hawaiian lap steels, and at least four amplifiers. The two mini Les Pauls are also illustrated in '60s Bizarre Guitars. These were the J-1 and TG-54, slab-bodied solid body electrics with bolt-on necks. Both had typical Teisco three-and-three headstocks, with a point or hump in the centre not unlike Kay guitars, but slightly more rounded. They had rosewood 'boards with large white dots, except for two small dots at the octave. The Teisco J-1 was a natural maple-topped guitar with a single pickup near the adjustable wooden bridge, a large affair with a metal cover with six slots parallel to the strings and two round bulbs on either side, very space-age! The stop tail was probably rounded, allowing strings to pass through the body, and was covered with a square metal plate. A small pickguard sat between the pickup and the neck. A volume and tone control sat on another little piece of plastic down on the lower treble bout. Knobs were white plastic knurled with a silver ring around the top. The Teisco TG-54 was a two-pickup Les Paul, named for the year it was designed, 1954, not long after the original! It had a large white plastic covered pickup at the neck, set into the pickguard, and a slanted metal-covered pickup set into a metal tailpiece assembly, sort of like a Telecaster. Again, strings passed through the tail assembly and the body. Similar to the J-1, the volume and tone controls (same knobs) sat on a small rectangular plate, this time metal like a Tele, with an added chicken-beak three-way rotary selector switch. The model designations of the archtops are unknown. Later these guitars would have either a PE or EP model designation, so presumably the ones in the photo did, too. One appears to be a full-sized, thick-bodied archtop with a rounded cutaway. Not much is visible in the photo, but it apparently had a single, white-covered pickup at the neck, block inlays and a white pickguard. The other guitar had a single pointed Florentine cutaway and was slightly smaller than, say, a Gibson ES-335. It's impossible to tell the depth from the photo, but it looks as though it's a thinline. This, too, had a single white pickup at the neck, moveable adjustable bridge, trapeze tail, large white pickguard (not modelled on a typical Gibson shape, by the way), a little plastic plate on the lower bout with volume and tone, with white knobs. The fingerboard has large white dots, with double small dots at the octave. The f-holes are three-part; the headstock Teisco three-and-three. The Hawaiians are likewise hard to identify. One looks to be similar to the later Teisco EG-7L, with a Gibson sort of shape and a pair of offset rocket shapes on either side of the pickup which house roller wheels for volume and tone. A second appears to have a rounded body similar to a Rickenbacker frying pan, looking perhaps like the later Teisco EG-K. This had the same slotted pickup as the J-1, and a single volume control. Finally, there's an unidentified eight-string lap with an elongated sort of rectangular body and an elevated fingerboard. This had a volume and tone with white knobs, and the tuners were behind the head, rather than sticking straight up, as on later eight-strings. The amps are interesting and also pretty much impossible to I.D. These were, of course, tube amps. Their basic cosmetics consist of two-tone tolex or vinyl covering - contrasting dark and light - arranged vertically with a wide band in the middle, just slightly narrower than the grill cloth. Cabinets had rounded edges, and, in fact, sort of look like '50s TVs. One was a small practice amp, with two medium sized amps about 15" or so high, and one humongous amp, complete with six 8" speakers (which looks like the later HG-8). Two other Spanish guitars were available in 1954 which were not shown in the Teisco history photo, the J-2 and the TN-54. The TN-54 is pretty much a mystery and is completely unknown. The J-2 pictured left has had some modifications made top it. A few years later, both J-1 and J-2 models had become double-cutaways. Also shown in '60s Bizarre Guitars, but not in the Teisco book photo, is a ca. 1954 Hawaiian Teisco EG-R which was sort of shaped like a Gibson and which had the same pickup as the J-1, with more elaborate symmetrical metal rocket shapes on the sides, housing the volume and tone controls. A chrome dome sat in front of the pickup between it and the dot-inlaid fingerboard. The head was stubby and rectangular. This was very "Moderne" looking, very Buck Rodgers. At least one other Teisco guitar was available from around this time in the '50s, probably slightly later on - another mini Les Paul that was the '50s piece de resistance, the J-5. The J-5 was a single-cutaway solid body that went beyond the other more derivative LPs. This had a slightly elongated body shape, with less pronounced waist than a traditional Les Paul. The upper bass bout headed toward the neck with a more angular, almost pointed corner rather than the typical rounded shoulder. The cutaway horn was also more angular, heading out at almost a right angle to the neck. It has a glued-in neck. The fingerboard was bound, and featured the typical large white dots with two small dots at the octave. The headstock was a white-concave dip across the top. Tuners had white rectangular buttons. These would be interesting enough, but the body had a bound flamed maple top - flat, not carved. The pickguard followed the body profile, with an extension down the lower side for the volume and tone controls. On the black pickguard were two black-covered pickups, looking sort of like P-90s. Pickup selection was with a chicken-beak rotary three-way switch. Knobs were white knurled with silver top rings. The bridge was a typical adjustable wooden type. Again, a large tailpiece assembly allowed the strings to pass through the body. This is a very beautiful guitar. By 1955 the Teisco line had become quite large, indeed. My only reference for these guitars is a listing, so no detailed descriptions are available. Solid body electrics in the '55 line remained the J-1, J-2, TG-54 and (presuming it's a solid) the TN-54. The J-1 and J-2 were probably still single-cutaways at this time. The '55 hollowbody line consisted of no less than eleven guitars. Models included the EP-4, EP-5, EP-6, EP-7, EP-11, EP-12, EP-13, EP-14, EP-15, EP-16, and EP-23 (Pictured Below). Clearly, in these instances, the numerical designation indicates appointments, not the number of pickups. Some of these are likely to be thin-bodied archtops with no cutaways, some thinlines with a single cut, and some full-bodied archtops with a single cutaway, with either one or two pickups, and no vibratos. Finally, there were some twelve Hawaiian lap steels in '55, the EG-NT, EG-K, EG-Z, EG-A, EG-S, EG-R, EG-L, EG-7L, EG-P, EG-8L, EG-M and EG-NW. Again, since I have no reference materials, there's no point in attempting any description. However, many of these guitars continued on into the '60s where we'll discuss them in detail, and you can probably extrapolate backwards to these mid-'50s models, allowing for pickup changes, etc. Legible in the essay in '60s Bizarre Guitars is a list of numbers which probably indicates amplifier availability in '55, since the numbers are similar to those used to signify slightly later Teisco amps. These were the #30, #28, #17, #40, #6, #7, #5A and #5B. 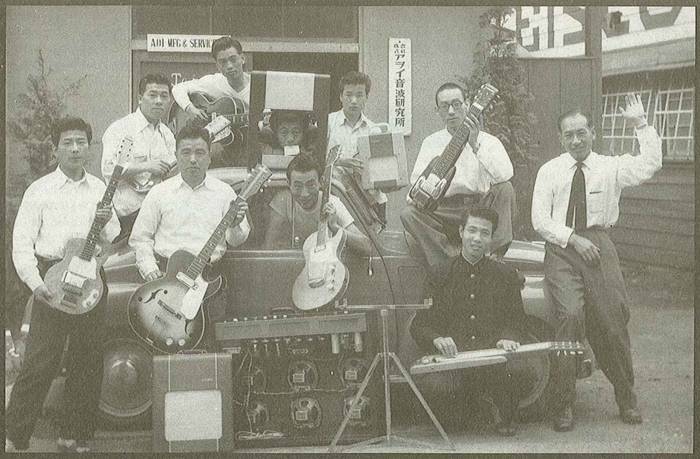 In 1956, the company changed its name from Aoi Onpa Kenkyujo to Nippon Onpa Kogyo Co., Ltd., while the instruments continued to be called Teisco. The logo changed to include Nippon Onpa Kogyo Co Ltd.
Little data is to be had on Teiscos from the late '50s, but it's probably safe to assume the line continued on roughly as before. In 1958 the EP-61 joined the line. This was obviously not numbered for the year of introduction! It's not known what this guitar was, but shortly thereafter the high-number EPs were fancy full-bodied archtops, so that may have been it. At some point before 1961, the Teisco logo also changed from italicized blocks to a more modern, thin sans-serif typeface with a large, swan-shaped "S" in the middle which joined the "e" and the "s."
As mentioned, most of the '50s Teisco guitars were heavily influenced by Gibson-style design. At the very end of the decade or just at the dawn of the '60s, Teisco guitars began to change to double cutaways and exhibit a playful - if slightly frumpy - more Fender-oriented design aesthetic. This was almost in lock-step with American guitar industry trends. Gibson launched its thinline ES-335 in 1958 and, indeed, changed its single-cutaway Les Paul to the double-cutaway SG in '61. American manufacturers such as Kay and Harmony quickly followed suit. The Teisco change was a part of the guitar Zeitgeist. Teisco's design changes also no doubt had a lot to do with the emerging importance of the American export market which was just about to explode. It was at the very end of the '50s that demand for guitars in America began to mushroom at an incredible pace, as the post-War Baby Boomers began to come of picking age. Large-scale traffic in guitars between Japan and the United States began in the very late '50s. Jack Westheimer of Westheimer Sales Company has published his recollection of having begun to bring in Kingston guitars purchased from the Terada Trading Company in around 1958. 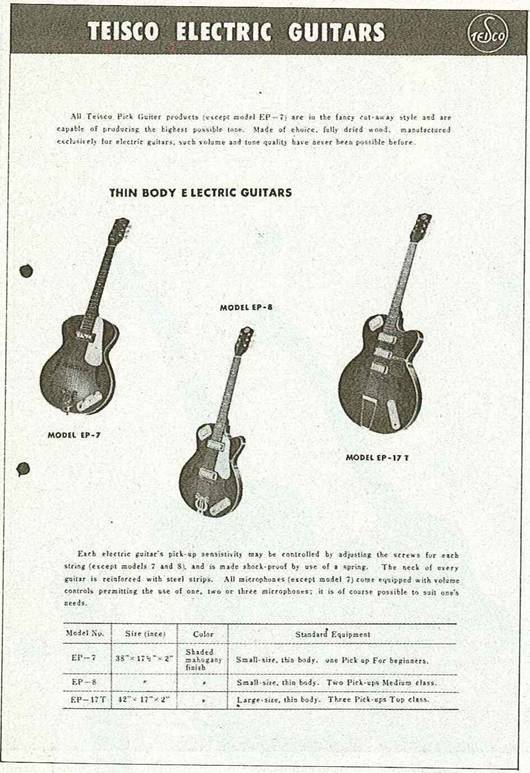 The Japanese themselves began advertising their wares to American distributors as early as July of 1959, when Guyatone ran a small space ad touting small pointed single cutaway solidbodies more or less resembling Teisco's mini-Les Pauls. In the Spring of 1960 the Kent Musical Instrument Company (20 East 15th Street, New York City) was founded as a subsidiary of prominent New York distributors Buegeleisen and Jacobson. Its first products were microphones, cables and aftermarket guitar accessories like pickguard/pickup assemblies for archtop guitars and soundhole pickups for flattop acoustics. In 1960 the Marco Polo Company (1055 E. First Street, Santa Ana, CA) began importing Japanese guitars (many by Suzuki), including electrics, which it began to advertise in 1961. Kent began promoting Japanese solid body electric guitars (mainly Guyatones) in April of 1962, although by the Fall of '62 the Kent Standard series consisted of Teisco models. 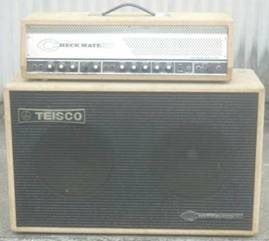 In terms of the Teisco brand, the moving force was Jack Westheimer and his company Westheimer Sales Company. 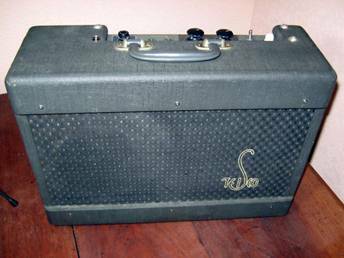 According to published accounts, Westheimer began importing Teisco-made Kingston’s in around 1961, although these were not promoted in the trade press until the beginning of '64. It was this connection that would make Teisco the dominant powerhouse it was to become. The first signs that the times they were a-changin' began to appear in 1960 with the debut of the T-60 and the EB-1. The T-60 (named for the year) was a more-or-less Jazzmaster-shaped guitar with an extended upper horn and backward-sloped lower cutway. Even the pickguard was similarly shaped, although not tripart, bearing three pickups, the bridge pickup angled slightly like a Strat. Controls included one volume and one tone and a chicken-beak rotary selector. This had a covered bridge/tailpiece assembly. The headstock was a long, extended variation on a Fender Strat head, with six-in-line tuners, with a round sticker Teisco logo on the round tip. Fingerboard inlays were the soon-to-become-signature rectangles along the upper edge. However, the most striking detail was the so-called "monkey grip," a handle-shaped cutout on the top of the lower bout. This design would continue through the early '60s (two decades before Ibanez would introduce it on its JEM guitars!). The EB-1 was probably Teisco's first electric bass guitar. This was basically a Fender Precision bass copy, with a P-bass offset double-cutaway body, bolt-on neck, Tele-style four-in-line head, the fingerboard edge rectangle inlays, a wooden adjustable bridge and a covered tailpiece assembly. The pickguard was very similar to Fender, with a single pickup in the middle. It's not known how long this bass was offered, but by the following year the similar EB-2 was introduced, and no mentions of the EB-1 are encountered, so perhaps it only lasted around a year. An instrument designated P-1 was also introduced in '60, but no information about what this was is available. By 1961, at least, the makeover was complete. The old mini Les Paul, the J-1, was changed to become a sunburst double-cutaway solid body. These had widely flaring equal cutaways, a single rectangular neck pickup, a large pickguard which covered most of the treble side, a wooden adjustable bridge, covered tailpiece, volume and tone. The bolt-on neck now had a more Gibson-style open-book head shape (with round logo sticker). The fingerboard had the old large dots with two small octave markers. The J-1, in a number of forms, would survive the early 60’s. The J-2 completely evolved and had also become a double-cutaway stratocaster style guitar; it most certainly was still in the catalogue, as a double-cut, in '62. Joining the J-1 (and J-2) were the sunburst J-3 and J-5. These had no real relationship to the earlier, very fancy J-5 mini Les Paul. These both had somewhat larger bodies with narrower waists and had ever-so-slightly offset double cutaways, with the upper horn just slightly extended. The bolt-on necks were similar to the J-1, with an open-book head and large dots, with added binding. The J-3 had a single rectangular bridge pickup, while the J-5 had a pair of pickups and a chicken-beak selector on the upper horn. The pickguards covered just the area under the pickups; controls were mounted on the top, volume and tone for the J-3 and three controls on the J-5. The T-60 "monkey grip" guitar was still present in '61. New was the EB-2, which had a P-bass body shape, a bolt-on neck with a P-bass-style four-in-line headstock, rectangular fingerboard edge inlays, a large pickguard with one centre-placed metal-covered pickup, volume and tone. At least five sunburst hollow bodies were offered in '61, the PE-7, PE-8, PE-13, PE-14 and PE-51. These have glued-in necks, by the way, with the open-book head, circular sticker logo and rectangular metal-covered pickups. The PE-7 was a non-cutaway thinline with dots, a single neck pickup, elevated pickguard, a fancy lyre trapeze tailpiece and volume and tone controls mounted on the lower bout. '60s Bizarre Guitars shows a ca. '61 PE-8 with a single black-plastic-covered pickup with Teisco printed on the top, small strip inlays, wooden pickguard, a fancy harp tailpiece and volume and tone mounted on the lower bout. The following year this model would have two pickups, so whether this is typical or not is unknown. The PE-13 and PE-14 were single-rounded-cutaway archtops, the difference being in finish, the former being blonde and the latter sunburst. Both these were full-bodied jazz guitars, with the small block inlays, twin pickups, chicken beak selectors, elevated 'guards and two volumes and two tones mounted on the lower bout. Some of these carried fancy Gibson Johnny Smith trapeze tails. The PE-51 was a twin pickup, single-rounded-cutaway thinline archtop, with a chicken beak selector, ordinary trapeze tail and one volume and tone on the lower bout. Hawaiians were still available, but no information was available to me except on the EG-TW which was an eight-string double-neck with three telescoping legs. Each neck had two pickups, a selector switch, volume and tone control. Also offered was a curious instrument called a "Harp Guitar," which was some sort of three-legged Hawaiian console with four electronic pedals! Amps available in '61 included the large HG-8 (recommended for use with the EG-TW and Harp Guitar), the Amp-75C, Amp-73C, Amp-72A, Amp-72B, Amp-72C, Amp-71A, Amp-71B, Amp-71C, Amp-30, Amp-4C, Amp-15 and Amp-86 bass amp. 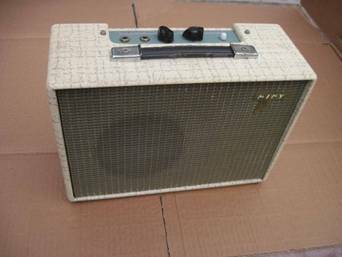 These came in a verity of shapes, mostly with either a single colour covering with a tweed grill cloth, or the two-tone Amp-30 or the two-tone Amp-15 with a cross-shaped grill cloth area. All had the Swan-S logo. These were most likely still all tube amps at this point in time. The Teisco line probably continued more or less as before into 1962. Both the J-1 and J-2 are definitely offered, as double-cutaways (as are the J-3 and J-5). Archtop-wise, the PEs apparently went into the '62 and sometime in that year was renamed with the EP prefix, but otherwise remained the same. No detailed info on the full line is available, but the '62 PE-8 had a bound fingerboard, small block or strip inlays, a single rounded cutaway, a rosewood pickguard, two - not one - metal-covered pickups (with one row of exposed poles along the edge), a chicken-beak selector on the upper shoulder, and four controls on the lower bout. Two basic new solidbodies were introduced in '62, The SD-4L/SD-2L and the SS-4L. doubt. The thumbwheels were for volume and tone, while there were a total of six rocker switches. Four of these were on/off for each of the four pickups, but in between were two more. Their function is unknown, but a good guess would be phase reversal between the front and back pairs of pickups. Both models had the rectangular fingerboard edge inlays. With "L" designations, both had vibratos. These consisted of a fairly simple bar for string attachment with a series of springs behind it, all covered with a hinged metal cover. The handle was extremely long. Pickups were the beefy tall rectangular type with metal cases and black plastic centre tops with exposed pole pieces (these could be screws or squares). The SD-4L had four pickups, in two pairs, while the SD-2L had two. If I couldn't have a Spectrum 5, I'd be looking for one of these. The SS-4L was almost identical in electronics and other appointments to the SD, with the main differences being in body shape, vibrato and pickups. The body was more like a Strat, except the entire lower horn was lopped off and slanted toward the lower bout. Very, very... well, this is one of those ideas that's so ugly it becomes beautiful! This had a new, very nifty vibrato system, one of the coolest the Japanese ever produced. This consisted of a plate or platform resting on springs, sitting above the top of the guitar. This then had a metal block with several holes along the treble side, into which the arm was inserted and secured with a thumbwheel screw. The SS-4L had two-tone metal-covered pickups with six poles along the rear edge, two half-slots exposing a gold insert in the centre and six holes showing the insert along the front edge. These "two-tones" would become a mainstay of many early '60s Teiscos. At least nine Hawaiian lap steels were offered in '62, and probably provide a good snapshot of Teisco laps at their apex. Included were the EG-NT, EG-K, EG-Z, EG-A, EG-S, EG-O, EG-U, EG-L, EG-6N and EG-8N. Since this is a good selection which probably reflects backward as well, we'll describe these in detail. The '62 EG-NT, EG-K and EG-Z were fairly primitive and appear to be leftover from the mid-'50s. The EG-NT had a small rectangular body with the bass side flush with the neck and the treble sticking out a bit to handle the controls. The head was stubby three-and-three with a circle Swan logo sticker and the fingerboard had painted diamond markers. The pickup looks to be the old slotted pickup of the early J-1, but may not be, with volume control. The EG-K was the Teisco version of the Rickenbacker Frying Pan, with a round body and neck with a head wider than the neck. This, too, had the rectangular head with a circle Swan logo. Markers were diamonds, the pickup was the slotted J-1 pickup, with one volume control. The EG-Z had an asymmetrical body with a short width on the bass side and a longer width on the treble side, with diamond markers and the stubby head. This had the old slotted J-1 pickup with volume control. The remaining '62 Teisco laps had a sort of paddle shape to the body, with sides wider than the fingerboard all the way up to the asymmetrical head with the circle Swan logo. The EG-A and EG-S had short scales and black fingerboards with the diamond markers, while the EG-U and EG-L had longer scales with fingerboards angled toward the bass side at the pickup. The EG-U had a light fingerboard with split-parallelogram markers, whereas the EG-L had a dark 'board with dots. All were six-strings with one black-covered pickup and a little plate with volume and tone controls. Tuners mounted from behind the head as on a Spanish guitar. The EG-6N had a similar profile but tuners were mounted on a square-topped head with the buttons facing up. This had a dark square-ended fingerboard with dots and a single chrome-covered pickup with black centre insert and exposed poles (same as on the SD-2L/4L), volume and tone control. The EG-8N was similar except for having a light fingerboard with black dots, and two of the chrome/black insert pickups, volume, tone and three-way select. A folding stand to hold the steels was available (this was a standard Teisco product from the mid-'50s on). In '62 Teisco also now offered some pickup assemblies for retrofitting acoustics. The GM-F1 and GM-F2 were for archtops. The GM-R1 and GM-R2 were for round-hole flattops. No details are available on what the numbers meant. By August of 1962, Teiscos were coming into the United States carrying the Kent brand for Bugeleisen and Jacobson. These early Kent’s were a mix of Teisco and Guyatone guitars. The Teiscos made up the Kent Standard series. This ceased in 1963. In 1964, the company name changed again, this time to Teisco Co., Ltd. At some point in '64 the Japanese Teisco logo changed from the circle Swan-S to a stylized, modern sans-serif type set in an italicized T shape. In 1964, WMI Corporation was importing Teisco’s with a Del Rey waterslide logo in front of a crown with a small Teisco underneath. In late 1964 early 1965 Jack Westheimer who had been importing Teisco prior to this, ceased importing from Teisco due to supply issues and began to import from Kawai. Del Rey, of course, is Spanish for "of the king," which explains the crown. This was no doubt added to the Teisco name, in part, to suggest quality. However, it was also a way to add the de rigeur Spanish cachet necessary for "Spanish" guitars of the time. It was convention that "Spanish" guitars carried Spanish names, except for the well-known brand names - Gibson, Fender, Martin or Kay; thus the plethora of imported guitars named Greco, Ibanez, Goya and España. Of course, none of these were made in Spain, but rather in Japan, Japan, Sweden and Finland, respectively! 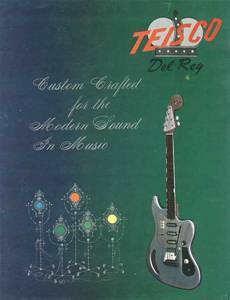 In Early 1965 WMI Corporation managed to obtain the exclusive rights to import Teisco Del Rey branded guitars. The guitars had a mixture of logos at this time and were in a transitional state. Some guitars had a stylized, modern sans-serif type set in an italicized T shape. Some still had the Del Ray Waterslide. 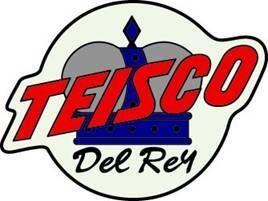 In late 65 WMI had phased out all the old logos on their imports and introduced the Teisco Del Rey logo. This had an italicized Teisco superimposed over a crown with a script Del Rey underneath, backed by a round circle. This being the most commonly known. What most of us know as the classic '60s Teisco line began in 1964. The year marked both the debut of many new guitar models, noted by a transition to a new headstock designs (which can help you date a particular guitar). As already noted, Teisco headstocks through the '50s were mainly variants of the Gibson three-and-three. Indeed, these remained into the '60s on Teisco hollow bodies. Beginning in 1960 with the T-60 solid body, Teisco began to use the elongated "Strat" six-in-line headstock. This lasted through 1963. In 1963, the squarish Strat headstock appeared with the GB-1 solid body bass. This seems to have lasted through 1965, but only on selected models, and with several subtle variations, including a slightly more rounded version. In 1964, probably later in the season, most of the Teisco solid body line acquired a new hooked Strat-style headstock with four-and-two tuners on the guitars and three-and-one on the basses. This had the little hook at the throat like a Strat, and a larger hook on the tip, almost like a Woody Woodpecker plume. Still in the '64 line was the MJ-2L, pretty much unchanged, except for the new hooked headstock in later '64. Given the evidence of Westheimer's Kingston’s, the MJ-1 and MJ-2 were probably still available. The BS-101 solid body bass also remained, with the new, hooked three-and-one headstock. Also still in the line were the WGs, including the WG-2L, WG-3L and WG-4L. Many of these are found with the squarish Bizarro Strat head well into '65, but they are also pictured in the '64-65 catalogue with the new, hooked four-and-two head, so expect to find either. Also apparently still in the line in early '64 was the SD-4L, which had adopted four of the two-tone, metal-covered pickups found on the SS-4L guitar. This still had the old, elongated Strat head. It also had the platform vibrato system found on the previous SS guitars. The SD-4L probably didn't make it into '65, but the shape was taken over by the more conventional TG-64. New in '64 were the TG-64 (named for the year) and a matching series of solid basses. The TG-64 was essentially a Fender Jazzmaster shape with a slightly extended bass horn, the new, hooked four-and-two headstock (usually with a metal plate on the front), and best of all, our old friend the "monkey grip" handle in the lower bass bout, handed down from the old T-60. The pickguard was two-part, with one large piece under the strings and a little extension on the lower bout for knobs and jack. These had three single-coil pickups, usually the chunky, metal-covered kind with a black insert and exposed poles, although some have smaller oval metal covers with exposed poles, all controlled by three on/off rocker switches above the strings. A small sliding switch served as a rhythm mute, or lead boost, depending on your point of view. Some versions of the TG-64 had the same floating-table vibrato system as on the SD-4L; my guess would be that these were earlier versions, although one can't place too much faith in dating Japanese guitars by hardware appointments. Others had the more typical Japanese version of the Bigsby vibrato. This guitar was sold in the United States in '65 as the Teisco Del Rey Model ET-320, but by '66 had been dropped from the line. Companion to the TG-64 was the TB-64 bass. This was virtually identical to the guitar - including the three pickups and monkey grip - except it was a bass, so it had no vibrato. Two other basses debuted in '64, the NB-1 and NB-4. These were basically the same guitar as the TB-64 except they did not have the handle cutout in the body. The NB-1 had a single pickup and the NB-4 had two. The TG-64 was definitely a boss guitar, but even cooler was the TRG-1 transistorized guitar, also introduced in '64. This guitar did Nat Daniels one better and, instead of putting the amp in the case, put a transistorized amp and speaker in the guitar! To be fair, Danelectro did produce some guitars with a miniature tube amp built-in, but it's not known if these ever made it to production status. But the TRG-1 is a remarkable guitar available in a confusing number of variations. The 1964 TRG-1 was a slightly more asymmetrical variant of the WG body style, with offset double cutaways and offset waists. It had the squared-off Bizarro Strat head introduced in '63 and rectangular-edge fingerboard inlays. The tail was a primitive top-mounted trapeze. Most of the face of the guitar was covered with a large metal pickguard, which had one two-tone neck pickup. The volume and tone knobs were above the strings, as was a small sliding on/off switch for the amp. In the off position, the guitar played out as a normal electric guitar. Horizontal grill slots were cut into the pickguard, behind which sat a 3-inch speaker. The amp operated on two 9-volt batteries installed in back. The TRG-1 shown in the subsequent '64-65 catalogue had a new, hooked headstock, but all the examples I've seen have the squared-off Bizarro Strat head. Also, the model I have has a TRE100 designation on the back sticker, so at least some were called this. There was a second single-cutaway version, also called the TRG-1, with a thick waist and vaguely tubby Tele shape. It had a different grill shape and a slightly more rounded version of the Bizarro Strat head, but otherwise it was the same. There was also a version of the double-cutaway guitar with a vibrato. This was a small, metal-covered tailpiece with three springs in the housing and a handle that screwed into a hole in the cover. The TRG-1 was an amazing guitar and any serious collector of electrics should have one. The little amp worked quite well. While one wouldn't win any audiophile awards with the tiny radio speaker, a player could easily cause a ruckus in the back seat of a convertible with one of these babies. The TRG-1 is a Star-A-Star guitar! Information on the hollow bodies is available from catalogue pages reproduced in the Japanese Teisco history. They are not dated, but they show the "new" TRG-1 and EP-9 guitars, which debuted in '64, so presumably this reflects the '64 line. The line included four thinlines and four thick-bodies. dipped three-and-three head, dots, single neck pickup, trapeze tail, elevated pickguard and controls on a rectangular plastic strip on the lower bout. This was described as a guitar "...for beginners." Also available was the Model EP-8, the small thinline with a single rounded cutaway, bolt-on neck, non-dipped head, dots, two pickups, fancy harp tailpiece, elevated guard, rockers on the upper shoulder and controls on a rectangular plate on the lower bout. The Model EP-17-T was a regular-sized thinline with a single round cutaway, bolt-on neck, non-dipped three-and-three head, dots, three pickups, adjustable bridge, plain trapeze tail, elevated guard, three rocker switches plate-mounted on the upper shoulder, and controls on a rectangular strip on the lower bout. All three were offered in shaded mahogany finish. Brand new in '64 was Teisco's first double-cutaway, the Model EP-9, a small-bodied thinline hollowbody archtop. The EP-9 had a pair of pickups, mainly the oval kind with centre poles. This had the old centre-humped three-and-three head (no open-book dip), and the rectangular edge inlays. Controls were placed on the lower treble bout on a triangular plastic plate, with one volume and one tone, and two on/off rocker switches. There were also four full-sized archtops; the Model EP-14, Model EP-15, Model EP-17 and Model EP-18. These were basically all variations on the same guitar, with glued-in necks, non-dipped heads, mini-strip plastic inlays, single rounded cutaway, f-holes, adjustable bridge, trapeze tail and translucent pickguard. Rocker switches were mounted on a small plate on the upper shoulder, while the volume, tone and jack were on a small plate on the lower treble bout. The EP-14 (shaded mahogany) and EP-15 (natural) had two pickups. The EP-17 (shaded mahogany) and EP-18 (natural) had three pickups, some two-tone, some flat rectangular metal-covered. At least three 6-string Hawaiian lap steels remained in the Teisco line in '64-65. The H-39 was a cool piece with a rectangular body, tapered neck and slothead with tuners pointing up. This had two pickups, volume and tone, and the neat diagonally split fingerboard design as seen on the '63 EG-M. The H-905 was a similarly shaped and outfitted lap with a light colored fingerboard with black outlined rectangles for position markers. Then there was the new TRH-1 (transistorized Hawaiian). You guessed it. This was the H-39 with an extension behind the bridge where the built-in amp and speaker of the TRG-1 was situated, yielding a self-amplified Hawaiian lap steel guitar. Yowza! Teisco offered at least seven amplifiers in the '64-65 catalogue; three Teiscos and four Check Mates. This apparently marked the first appearance of transistors, although tube amps were still available in the 1966 catalogue. About this time, many companies began jumping on the transistor bandwagon. The three Teisco amps included the Teisco-88, the AMP-71R and the Miny. No details are available on these, but they were fairly rectangular cabinets with top-mounted controls. 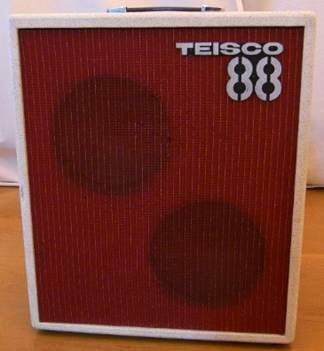 The Teisco-88 had "Teisco" and a big "88" on the grill cloth. The '66 model was a tube amp, so this likely was, as well. The rest were tubers as well. The Miny had the italicized T logo on the front. The AMP-71R had reverb. 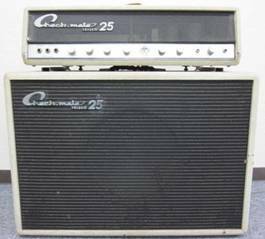 The Checkmates Tube Amplifiers were the 15, 20, 25 and 50. A good guess would be that the numbers represented the output wattage. These had lightly-covered rectangular cabinets with dark grill cloths and front-mounted controls. The Check Mate 15 and 20 were combos, while the 25 and 50 were piggybacks. Some of these models continued and became solid sate amps. No other details are known about these amps. 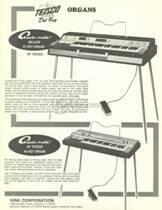 Finally, Teisco also began marketing two portable electric organs and two electric console organs at this time. Just exactly when W.M.I. 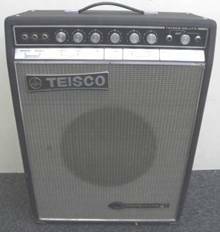 began selling Teiscos to Sears is unknown, but the '64-65 line was the first to appear with the Silvertone logo. The Teisco guitars introduced in '64 essentially continued into the '65 line. In '65, Teisco was heavily represented on "Go! Go! Go!," the Japanese TV version of "Hullaballoo." Also in '65, W.M.I. produced a Teisco Del Rey catalogue that offered some interesting wrinkles in the story. For starters, the guitars shown are the same as in Teisco's catalogue, but the models were all renamed with a one or two-letter prefix followed by a dash and a three-digit number. Solidbodies were designated E- for stoptails, and ET- for those with tremolos/vibratos. Basses were labelled EB-. The numerical suffix signalled the number of pickups in the first digit; the ET-320 had three pickups, the ET-200 had two pickups, etc. Hollow bodies retained the original EP- prefix and either single or double-digit suffix. Amps remained as the Checkmate line. So, the monkey-grip Teisco TG-64 became the Teisco Del Rey ET-320. The WG-2L became the ET-220, while the WG-3L became the ET-300 and the WG-4L became the ET-440. The old MJ-2L became the ET-200, while the MJ-2 became the E-200. The TRG-1 self-amplified guitar became the TRE-100 or TRET-110 with tremolo. The NB-4 bass became the EB-200. Two new models that would eventually become mainstays joined the Teisco line in '65. They were two double cuts with slightly more flared horns, in a sort of tulip shape. Both had a single, wide, chrome-covered pickup with poles exposed along one edge. This was similar to the old MJ-1 but by '65 would become the new SM series. Both had bolt-on necks with bound rosewood fretboards and the top-edge rectangular inlays. The E-100 had a bridge/tailpiece assembly, volume and tone on a small pickguard, and one of the elongated Strat-style heads. The ET-100 had a platform vibrato. As a sign of things to come, the Teisco Del Rey ET-100 had a regular Strat-style headstock, the first to appear on Teiscos, as far as I'm aware. Finishes shown in the '65 Teisco Del Rey catalogue included a black/brown tobacco sunburst, a fire-engine red and a metallic silver. Many pickguards were brushed metal. Another point to remember about '65 Teisco Del Rey guitars. While, in reality, Japanese Teiscos were never too particular about consistency in headstock design, they at least tended to show consistency in the catalogues. The American Teisco Del Reys were even more varied, and the '65 Teisco Del Rey catalogue shows a mix of the Bizarro square Strat head (the most predominant), the new '64 hooked design, and the older elongated Strat design. This is probably explained by the vicissitudes of stockpiles and shipping to the new American market. In any case, it makes it a bit harder to date these instruments. 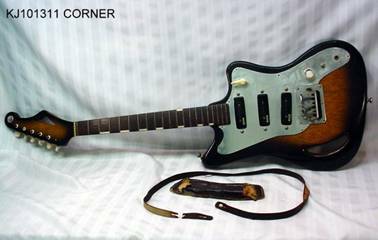 One very interesting and strikingly modern Teisco guitar, the YG-6, appeared in Japan in 1965. It was very near the classic Strat shape, with offset double cutaways and Strat-like contours, but the horns were more pointed. The neck had the new hooked headstock and the rectangular edge inlays. A large multi-laminated pickguard stretched from the upper horn down to the lower bout control extension. Three large rectangular single-coil pickups, with chrome sides and black centre insert (exposed poles) sat in front of a roller bridge and the clever platform vibrato design. Three on/off rocker switches sat above the strings, plus a small sliding switch, presumably a mute. It had one volume and one tone control, and is an exceptionally handsome guitar. A significant cosmetic change occurred in Japan in '65, which can help determine dates. Previously, almost all models had plain aluminium pickguards. In '65, export models switched to striped metal guards, with the alternating matte stripes etched into the metal. Thus, if you find a guitar Teisco with a plain metal guard, it's probably from '64 or early '65. If it has a striped metal guard, it's probably from '65 to ‘67. After this point all guards were changed to plastic. '60s Bizarre Guitars shows a pair of full-size hollow bodies, our old friends the sunburst EP-14 and blonde EP-15. These remained consistent except for a sort of axe head-shaped chromed metal control assembly down on the lower bout, and a rather large, distinctively shaped elevated pickguard. In 1966, Teisco guitars shed some of its adolescent awkwardness of the early '60s in favour of a svelter, hipper look. While some of the tubby bodies and monkey grips remained, they were joined by leaner shapes, thin, pointed, flared cutaways and German carve contours. In many ways, the '66 Teisco line is the quintessential year for Teisco, which is fitting since it would be the last under the original ownership. There are, by the way, a number of discrepancies between Japanese Teisco and American Teisco Del Rey literature from 1966. Many of the older models continued to be promoted in Japan, but not in the U.S. Virtually all guitars in U.S. literature are also seen in Japanese catalogues. This does not mean that just because W.M.I. did not promote certain models, they were not still available in America. Many may have gone to Sears as Silvertones, and it's possible that W.M.I. still brought in guitars other than those in its catalogue. 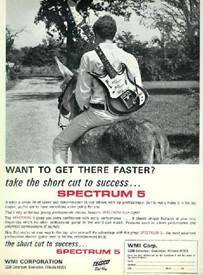 Of course, the big news was the introduction of the Spectrum 5. This had a slim, highly contoured body with a pointed upper horn pointing up and a hooked lower horn. The body featured a German carve relief along the edge. The head was the new hooked kind from '64-65, while inlays were triangular "picks," sort of like Kay’s of the time. Pickguards were two-part plastic covering the entire area under the strings, with volume and tone controls and stereo and mono jacks. The "vegematic" push-buttons came in five groovy colours. This guitar is cool enough to warrant an extensive quote from the '66 Teisco Del Rey catalogue hype: "The Spectrum '5' Electric Guitar is one of the finest guitars ever produced. It has unique features which no other guitar in the world can match. "Designing and making the Spectrum '5' was a labour of love. It required infinite patience and craftsmanship to sculpture solid mahogany wood into the graceful and intricate design. "The magnificent lustrous finish is the result of individual coats of hand rubbed lacquer - not two or three coats - but seven coats of lacquer individually hand rubbed. "The trim which follows the contour of the body is inlaid by hand. A beautifully styled triple ply laminated pick guard protects all working surfaces. "Spectrum '5' has an unusually thin neck. To achieve the proper rigidity in this fast action neck Teisco had to select the hardest (and the costliest) material available...Ebony. The adjustable neck is fashioned out of 5 plys [sic] of laminated Ebony to insure maximum strength. The fingerboard of the Spectrum '5' is likewise fashioned out of Ebony. Note the unique position markers and the extra wide, easy to finger frets. "The name SPECTRUM '5' was coined to denote five different basic colour tones which can be produced with this unusual guitar. Flick any of the five self-cancelling switches and this amazing instrument will reproduce sounds ranging from treble to bass - any combination of switches can be played to achieve an infinite variety of sounds. "What appears to be six pick-ups on the Spectrum '5' are actually three split pick-ups to produce stereo. The Spectrum '5' can be played monaurally or stereophonically at the flick of a switch. There are two channel outputs and a volume control for each channel. "The tremolo tail assembly was engineered specifically for the Spectrum '5.' The bridge is an integral part of the whole assembly and is, of course, universally adjustable. The marvel of it all, however, is that the tremolo does not exert any friction (hence no wear and tear) on the strings. The tremolo action causes the whole bridge assembly to move smoothly back and forth. "No amount of time and expense has been spared to create the finest and most unique guitar in the world. Length 41"." Now you see why these Spectrum 5s are so desirable! It is not clear, by the way, how many (if any) were ever made with ebony necks. The few I've personally seen had maple necks. Certainly the expense of the ebony would have been enormous and hard to justify on the Teisco brand name. Also, with the density of ebony, the guitars probably would have been hard to balance. In any case, these are the Holy Grails of Teisco! A companion to the Spectrum 5 guitar was a solid body bass version with the Spectrum 5 body shape. This was the Teisco EBX-200 Bass. It had two small pickups with two centre half-slots and two sliding on/off switches, with volume and tone and was described in the U.S. catalogue as having the 5-ply ebony neck. The neck had the three-and-one hooked head and an ebony board with dots, not the picks. Situated just under the Spectrum 5 were the Teisco K guitars. Indeed, these Ks may have been introduced slightly before the Spectrums, since they appear in a 1966 Japanese Teisco brochure that does not contain the Spectrum. A second '66 Japanese Teisco brochure contains both Ks and Spectrums. The K guitars were very similar in profile to the Spectrum, except that the horns were not curved, and flared out more or less equally in a more tulip shape, though still pointing slightly inward. These still had the German carve relief, 22-fret rosewood fingerboards, plus the new hooked headstocks. Inlays, however, were dots, and the vibratos were the more pedestrian Japanese version of the Bigsby. Pickguards were the new striped metal affairs introduced the year before, extending from above the strings down through the lower bout control area. The K-4L & ET-460 models had four of the large, chunky, single-coil pickups with chrome sides and black centre insert revealing six square poles. These were controlled by four sliding on/off switches, plus a 3-position switch for solo, rhythm and super bass sounds, as well as volume and tone. The roller bridge had a spring-loaded muffler/mute. The K-3L and ET-312 Models were similar to the K-4L except for having three pickups, two back by the bridge and one up at the neck, as if #3 had just been removed. This had the sliding on/off switches, another sliding switch for solo and rhythm tones, two volume and two tone controls. The K-2L and ET-230 models were the two-pickup version, otherwise identical. This had two sliding on/off switches and the third solo/rhythm switch. There was also a companion K bass, the KB-2 and EB-220 models with the K body shape. This was pretty much a bass version of the Ks, with the thick rectangular pickups and striped metal pickguard. Also new in '66 was the SM series, a variation on the E-100 and ET-100 introduced in the previous year, very similar to the Ks except the cutaway horns were flared outward in the classic Teisco "tulip" shape which would dominate later in the decade. These had fairly flat rectangular chrome-covered pickups, with a rectangular indentation stamped in the centre and six flat round poles, plus to long half-slots along both outer edges. The SM-2L (Teisco Del Rey ET-210) had the hooked headstock, small striped metal pickguard along the lower body, two on/off sliders, volume, tone, roller bridge and Bigsby-style vibrato. The SM-2L retained the German carve relief of the K series. A plain-Jane SM-2 (Teisco Del Rey ET-200) followed, sans German carve, and with a bridge/tailpiece assembly. The SM-1 (Teisco Del Rey ET-110) had just a neck pickup with volume and tone controls, bridge/tailpiece assembly, no German carve or striped metal pickguard, and the Strat-style head of the previous ET-100. The SM series, by the way, would spawn a number of descendents and eventually form the beginnings of the early '70s imported Kay guitar line. Still available in Japan in '66, but not promoted in the U.S. by Teisco Del Rey, were the Teisco TG-64 "monkey grip" guitar, its companion TB-64 bass, plus the similar non-grip NB-1 and NB-4 basses. The three-pickup TG-64 had a striped metal guard and the four-and-two hooked headstock with a metal plate on the front. The TB-64 probably still sported a plastic guard and three pickups. However, in the Japanese catalogue from '66, the TB-64 appears to be a 6-string bass, with an elongated variant of the hooked headstock with a rounded tip and a four-and-two tuner arrangement. 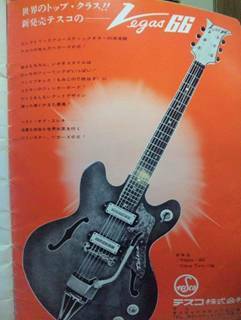 The same Japanese Teisco catalogue from 1966 that introduced the K series, but not the Spectrums, also still features the boss TRG-1 guitar with a built-in amplifier and speaker. 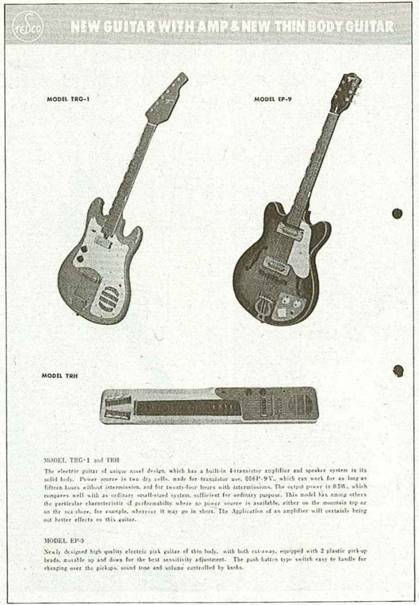 By the time the '66 catalogue featuring the Spectrum guitar and bass had appeared, the TRG-1 was no longer to be seen, so it probably bit the dust in early '66. Also still in the line in '66 were our old friends, the MJ series. These were essentially unchanged except for a new striped metal guard, the new hooked headstock, and a new chrome-covered oval pickup with an oval indentation stamped in the centre and six flat, round poles. Available were the MJ-3L (Teisco Del Rey ET-300), MJ-2L (promoted in Japan, but not the U.S.) and MJ-1 (Teisco Del Rey ET-120). The MJ-1 had a new on/off rocker switch and a second rocker for solo/rhythm. Promoted in Japan, but not the U.S., was the little BS-101 bass, pretty much unchanged from before. Also promoted only in Japan were the old WG series. Still around in '66 were the WG-2L, WG-3L and WG-4L, with striped metal guards and four-and-two hooked headstocks. The Teisco hollowbody line continued into 1966 with some interesting changes and additions. All were double cutaways, but gone were any traces of the single cuts of yore. New features included vibratos on the thinlines - something that, to my knowledge, had not previously been offered. The top of the archtop line featured two very nifty new models called the Vegas 40 and Vegas 66. The Vegas 40 (Teisco Del Rey EP-11T) double-cutaway thinline was promoted both in Japan and the U.S. It was a full size ES-335-style with two pickups (the large rectangular type with chrome sides and black insert, square poles), bound f-holes, volume and tone controls on the lower bout (no plastic plate) and a fancy new angular archtop Bigsby and roller bridge. The pickup selector was a rotary switch on the lower horn with a new round knob with a lever (versus the old chicken beak). The bolt-on neck had a new three-and-three head with a flared "check mark" indentation in the top, with wide wings on either side, a shape that would characterize a number of other models later in the decade. The fingerboard was bound, with dots. On the Japanese version, the headstock carried a zippy new typeface proclaiming "Vegas 40," while the pickguard used a similar angular script for the Teisco logo. The Teisco Del Rey carried its regular sticker. Along side the Vegas 40 in the Japanese catalogue (but not the Teisco Del Rey) was the Vegas 66, presumably named for the year. No descriptions of this are available, but it appeared to be almost identical to the Vegas 40. It cost just slightly more than its brother (1,000 yen), possibly due to better materials. Even cooler was the '66 Vibra Twin (Teisco Del Rey EP-12T), a twelve-string version of the Vegas. This had a slothead variation of the check mark head, with tuners facing alternatively out or back. The trapeze tail picked up the same angular design of the Vegas vibrato. Despite the Del Rey number, the EP-12T did not have a vibrato. The Teisco Del Rey in the '66 catalogue differs from the Vibra Twin shown in '60s Bizarre Guitars in that it adds a third rotary select for solo/rhythm/bass sound tones, whereas the Teisco omitted this feature. Figure on finding either. Another swell new hollowbody for '66 was the EP-200L (Teisco Del Rey EP-10T Deluxe). This had an offset double-cutaway body basically like a Strat, with offset waist and a groovy single f-hole shaped like a stylized T. It also had the hooked four-and-two head, dots, twin square-poled pickups, roller bridge and Bigsby, and an elevated pickguard and semicircular control plate on the lower bout. Controls included two on/off rockers and a third solo/rhythm rocker, with volume and tone. The EP-200B Bass was a hollowbody bass version of the EP-200L (for once, both sides of the Pacific used the same number! ), with standard f-holes, trapeze tail, volume, tone, and simple rotary select with the new chrome lever knob. In the '66 American Teisco Del Rey Catalogue, the small, humble EP-9T was left over from before (formerly EP-9), with the quasi-Gibson style head and triangular control plate. The only thing new was the Bigsby (thus the T). 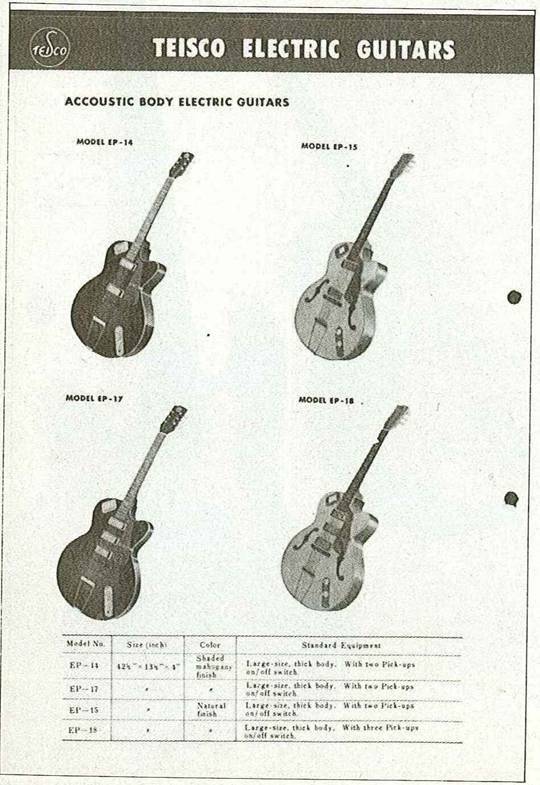 In the '66 Japanese catalogue, the small thinlines were represented by the EP-2L and EP-1L. The EP-2L looks for all the world like the EP-9T, with the large rectangular pickups with black inserts, controls on the triangular lower bout plate, and a long-armed trapeze vibrato with a curved handle. The EP-1L was the same except for having a single metal-covered pickup at the neck. Hawaiian lap steels are not in the American Teisco Del Rey catalogue, however, five laps remained in the '66 Japanese Teisco catalogue. Still available was the Harp-8, an 8-string console with two pickups and some sort of electronics controlled by four floor pedals. Still around were the H-39, the H-905 and the self-amplified TRH-1. Also available was the H-850, a single-pickup 6-string very similar to the H-905. Amps offered by Teisco in the '60s can sometimes be confusing, because they were a mix of tube and solid-state, and sometimes particular models shift back and forth. 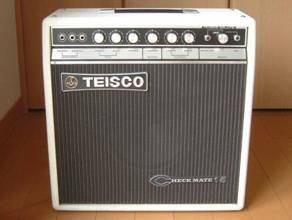 Amps promoted in the U.S. tended to be solid state, whereas many amps promoted in Japan were mainly tube. At least eleven solid-state Checkmate amps were offered in U.S. Teisco Del Rey catalogues in '66: the 10, 12, 14, 16, 17, 18, 20, 25, 50, 100C and Infinite. These were basically rectangular cabinets with dark tolex covering and large checkered grill cloths with the Teisco Del Rey and Checkmate logos on either corner. Controls were front-mounted. Specs for combos were as follows: Checkmate 10 (6 watts, 6" speaker, two inputs, striped grill cloth); Checkmate 12 (9 watts, 8" speaker, three inputs); Checkmate 14 (14 watts, 8" speaker, three inputs, tremolo); Checkmate 17 (20 watts, 10" speaker, tremolo, reverb); Checkmate 16 bass amp (20 watts, 10" speaker, volume, tone); Checkmate 17 (20 watts, 10" speaker, reverb, tremolo); Checkmate 18 (30 watts, two 10" speakers, reverb, tremolo); and Checkmate 20 (40 watts, 12" speaker, reverb, tremolo). 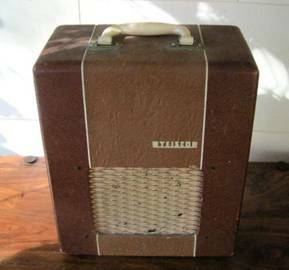 Piggyback amps included the Checkmate 25 (50 watts, 15" speaker, reverb, tremolo); Checkmate 50 (two-channels, 100 watts, two 15" speakers, reverb, tremolo, "E tuner"); Checkmate 100C (two channels, voice input, 200 watts, two 15" speakers, reverb, tremolo); and the big hugger-mugger Checkmate Infinite (200 watts, two 15" speakers, stereo/mono preamp section, reverb, tremolo and a bunch of other switches). The one shown in the catalogue actually has a block Teisco logo and carried the Japanese-marketed name - King - in the lower corner. The 1966 Japanese Teisco catalogue shows several additional amps, including the Teisco-88 combo (8 watts), Checkmate-15 combo (15 watts), and the Bass Note combo bass amp. These were tube amps. 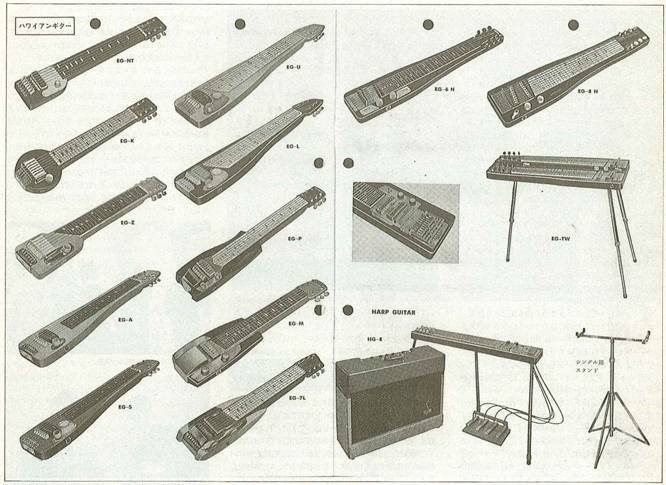 The Japanese catalogue also shows a number of neat Teisco accessories, including guitar, lap and bass strings, a microphone, three add-on pickups (GM-F1, UP-1 and GM-X2). There were also a number of fingerpicks, slides, a volume pedal, strap, rectangular moulded hard-shell case, and what appears to be an FM wireless transmitter. Also listed are two Teisco electronic organs. You have to hand it to Teisco. The '66 guitar line was pretty impressive and many were definitely not derivative. In January of 1967, the Teisco company was purchased by the Kawai company, which is best known for its high quality pianos. Kawai had begun making its own guitars in about 1956 and had been one of the players in the American guitar boom of the '60s, although not to the same degree as Teisco. There was no immediate effect of the new Kawai ownership on the '67 Teisco line, although changes would come soon enough. A snapshot of the '67 line can be seen in a Bennet Brothers catalogue from that year. Basically, the entire '66 line was present. Bennet Brothers escewed both the Teisco and W.M.I. numbering schemes and gave the models new names. Bennet Brothers also sold the '66 Checkmate amp line, and packaged them in a number of guitar-and-amp combination packages. This basic '66-67 Teisco line lasted unchanged at least through the Summer of Love. Many survived into late '68 or early '69, but incorporated a number of stylistic changes. Several new models related to the '66-67 line also appeared in 1967. One was the nice little Spectrum-22, which basically had the Spectrum body, head, neck and fingerboard (with pick inlays), but with more conventional Bigsby, roller bridge, sliding on/off switches and a pair of the chunky rectangular pickups with square poles. This guitar lasted at least through 1968 and was pretty much the prototype of an expanded Spectrum line which would appear either at the end of '68 or early in '69 (probably the former). Another new '67 model was a cool KB-2 bass, with the K body style. This had the pick inlays, by the way, and a pair of pickups one encounters occasionally with clear plastic tops showing the paper bobbin and wire winds inside. This also had some designs engraved on the plastic pickguard, a sign of things to come. This guitar would last through '68 and, with a change of pickups, become part of the late '68-early '69 Teisco line. While the principal export line remained the same when Kawai took over, certain changes in Teisco offerings did begin to emerge. Some of these were no doubt due simply to the evolving guitar market, but others clearly reflected the sensibilities and tastes of the new owners. These can be seen in two other instruments which debuted in '67, the FB-2 violin bass and the DG-67 guitar. The FB-2 bass was a violin-shaped hollowbody, inspired by EKO's violin bass. The appearance of this design was an early sign of the coming trend in copying other guitar designs, which was about to explode. It's interesting that the Japanese focused on the violin-bodies, although the violin guitars and basses being made by EKO in Italy and imported into the U.S. by the LoDuca Brothers in Milwaukee were, at the time, particularly successful in America. This was quite a sore point with the LoDucas because the Japanese copies immediately began making serious inroads into the EKO market share. It's even more amusing because the EKO instruments were really copies of the Höfner violin guitars and basses, themselves copies of the Gibson violin basses, themselves copies of real...well, you get the picture! The FB-2 had the round-scrolled violin headstock and a pair of chunky pickups with chrome sides and black insert, now with a pair of rectangular slug pole pieces. The select was a three-position rotary with a chicken-beak. The bridge was an adjustable archtop wooden unit; the tail a new oval chrome trapeze. The tortoise pickguard was elevated. These were finished in a natty three-tone black/red/yellow sunburst. Although the FB-2 never really showed up in the W.M.I. import offerings in the U.S., it was still being offered as late as 1969. The DG-67 was another decidedly different Teisco solid body debuted in '67, under the new Kawai hegemony. Certain Spectrum influences are visible in this axe, but perhaps more significantly, they're also more than a bit of Burns. For reasons I've yet to discover, a number of Japanese manufacturers became quite taken with Burns products. The 1967 and '68 Tele-Star lines (manufacturer unknown), for example, were full of Burns Bison and Jazz Split-Sound interpretations. Kawai was another company enamored of the inwardly turned Bison horns. Thus, it's curious that the DG-67 had an offset double cutaway body with very sharp, inwardly curving horns. The body had a German carve contour along the horns to the slightly offset waist. There was a taper to the lower bout. The bolt-on neck ended in the new check-mark headstock; truss adjustment was at the body. The bound fingerboard had a zero fret and block inlays. The two pickups were black-covered with exposed poles. The neck pickup was angled slightly back toward the bridge, as would be subsequent Mosrite-copy guitars, and a tiny multi-lam pickguard sat between the pickups. The three-way toggle was on the lower horn, while the volume and tone were mounted directly on the top of the lower bout. This had a roller bridge and a new, square, almost art deco Bigsby vibrato design. I'm not sure if this very interesting DG-67 guitar ever made it to the U.S. 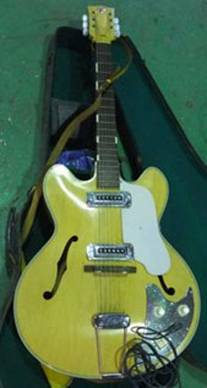 I've never seen one and have never sighted anything similar in Teisco Del Rey or any other catalogues. And, with this curiosity, we'll pause again before forging ahead to the conclusion of the Teisco story, where we'll discover its connections to a venerable American brand. Till then, happy trails to you! Invaluable help in preparing this story was provided by Horoyuki Noguchi, Makoto Takahashi, Bob Ohman, Scott Freilich and Michael Lee Allen.